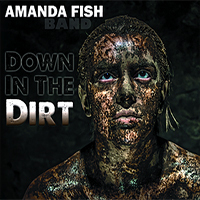 Boldly stepping outside the classic blues territory, Amanda Fish cranks up exquisite maturity on “Down in the Dirt”, her latest studio release. An almost haughty confidence permeates this concept album, a showcase of personal issues dipped in exciting musicianship. The latter is driven by guitarist Cole Dillingham and bassist Cliff More who, alongside Amanda’s swaggering vocals and Kristopher Schnebelen’s inspired work behind the kit, have crafted something of a crossover gem. The introduction of slide man Sean McDonnell on “Player Blues” adds and extra dimension, i.e. colour and space, marking one among many ingredients responsible for considerable flavor enhancement that comes with this ambitious blues infected brew. From the funky stings, that starts poking feverishly with “I’mma Make You Love Me” to the plaintive, latino infected “Prisoner of Your Touch”, Amanda Fish pushes her songwriting in different directions – and emerges carrying smiles all over. She certainly has versatility crowned with a generous amount of resourcefulness. Her delivery is bursting with character on “Hard Walkin’ Blues” and “I Don’t Need It”, whilst on “Lady of the Night” she eases herself into reflective and respective jazz rock that gives the album a radio friendly edge. The mixture of genres is compelling, on paper at least. This often packs the ever-lurking danger of an artist spreading oneself to thin. Still, Amanda Fish shows she has the talent (as well as all the necessary tools) to keep things in perspective. Cheers!